Indonesians of all ages turn out to see a splendid new statue commemorating Barack Obama’s brief childhood sojourn in the capitol Jakarta. 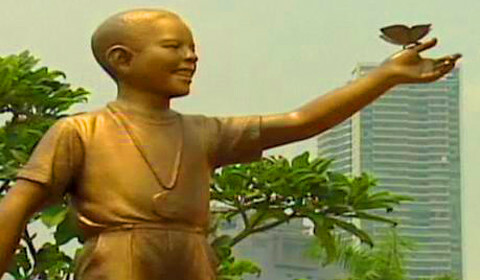 The BBC has locals hero worshiping Barack In Bronze, but the Jakarta Globe talked to a less happy resident. Pre-Presidential knees in representational art have proud precedence of course in the Michigan Boy Scouts stirring tribute to local Eagle Gerry Ford.